Birth Place: Hackney, east London. Anthony Newley's entertainment career began as a competent and successful child actor. His best known appearance during these early days was as the 'Artful Dodger' in the 1948 film production of Olver Twist. His film making career continued unabated until he played the part of a pop star in the 1959 production of 'Idle On Parade'. This led to the issue of an EP bearing the same name and the release of the strongest song from the film as a single 'I've Waited So Long'. This reached the UK #3 spot and through this he launched a second career. The EP (DFE6566) shown here contained four songs from the Movie "Idle On Parade". I've flipped it over because I think the picture on the back shows Tony to better effect. If you want to see the front then just move your mouse pointer over the picture. 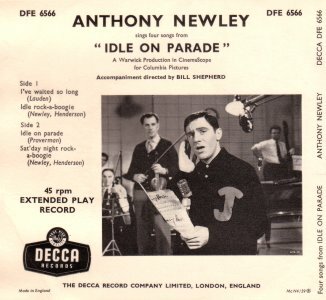 Anthony Newley's musical output can be described as an eccentric mix. It was a mixture of covers of American pop material, like 'Personality' and 'Why'; novelties based on traditional songs like 'Strawberry Fair' and 'Pop Goes The Weasel' and romantic ballads like 'If She Should Come To You'. It was a style that is known to have influenced the young David Bowie, who captured some of the eccentricity in the 'Laughing Gnome' many years later. His UK singles career was relatively short, but towards its end he began writing successful musical material himself. His greatest successes came from Musicals, the most significant of which was 'Stop The World'. He also appeared on record with his wife, actress Joan Collins, in the non-musical comedy album 'Fool Britannia'. Anthony Newley continued writing successful songs, usually in partnership with his friend Leslie Bricusse, and frequently performed himself. Bricusse and Newley had a number of noteable successes, including 'Goldfinger' and 'Candy Man'. His most recent appearance on UK television was a return to acting in the Soap opera 'East Enders' in which he played the part of a used car dealer. Anthony Newley died from cancer in 1999. Decca DFE6566 1959 "Idle On Parade"
Decca DFE6655 1960 "More Hits From Tony"
Decca DFE6687 1961 "This Time The Dream's On Me"
Gone With The Wind/This Time The Dream's On Me/It's The Talk Of The Town/What's The Good About Goodbye?